Photo Credit: Katie Bristol – Treebeard and Raina standing in their dry land wheat field. Although Tree had been farming a bit in California, “that first year in Washington was a steep learning curve,” he admits. “It was dryland farming and we didn’t have all the right equipment to conserve moisture, so we weren’t always getting high yield crops. And if your crops failed, there was no backup.” After some experimentation with different grains and a dogged persistence in eradicating the invasive plants, Treebeard harvested some crops that could be sold and milled, which initially he did through a west-side distributor. Treebeard had been growing White Soviet rye here and there, as he experimented with various spring grains and fall grains. “Rye is wild,” says Tree. “It has a survival gene. It will lie dormant in the soil for 20 years and then raise its head. It freaks farmers out.” It penalizes them, too, as commercial growers are docked if rye is found in their grain samples. “It shows up in white wheat all the time,” Tree explains. After learning about Tetra Pectus rye from a neighbor, Tree sowed a crop of it. “They call it ‘Texas Pecker,’” says Tree, “because it’s such a vigorous plant. Some of my crops were 9’ tall.” “It’s the ultimate hassle to harvest it,” he adds, with a bit of admiration for the grain. Treebeard started keeping his own seed, but he quickly learned to trade with other farmers in the area. “Nobody was taking soil tests back then,” he says, “so if you had a deficiency in your soil and you kept sowing your own seed, you just perpetuated the problem.” Fortunately for Bluebird Grain Farms, however, Tree continued to save his seed; Tree’s 35-year-old organic rye seed is the genesis of Bluebird’s current rye crop. Don’t get Sam or Tree started on the virtues of rye unless you have some time. Rye grows in colder temperatures and sandier soils than wheat or oats, making it an ideal crop for harsh farming environments. It can be grown as a grain or a forage crop. It has a high level of fiber in its endosperm—not just in its bran—so it has a lower glycemic index than products made from wheat and other grains, making it conducive to a diabetic diet. Some claims link it to mitigation of menopause symptoms and breast cancer prevention. It can be cooked as a whole grain, rolled like oats, sprouted for salads and sandwiches, or milled into flour. And, of course, if one is so inclined, rye can be fermented into vodka. Distribution of his grains in the early days was mostly local, says Tree, with a few west side places carrying their products. But eventually the Cinnamon Twisp Bakery discovered them, after sourcing a load of bakery equipment through a defunct Tonasket bakery. And then Sam and Brooke got wind that Treebeard was doing dryland farming and started asking questions. “They thought they wanted to do what we were doing,” says Treebeard. The three met a number of times, sometimes accompanied by Ed and Vicky Welch (of Sunny Pine Farm), and thus developed a friendship that has transcended the farming connection. It was in recent years that Sam learned more about Treebeard’s rye and explored the option of acquiring his rye seed. “It’s a very special strain,” says Sam. “It’s just this big beautiful rye and it was developed in this area.” Bluebird’s rye crop is planted in the fall and overwinters, going through the vernalization process and resulting in a sweet, high-fiber grain that is sold as both whole berries and flour. 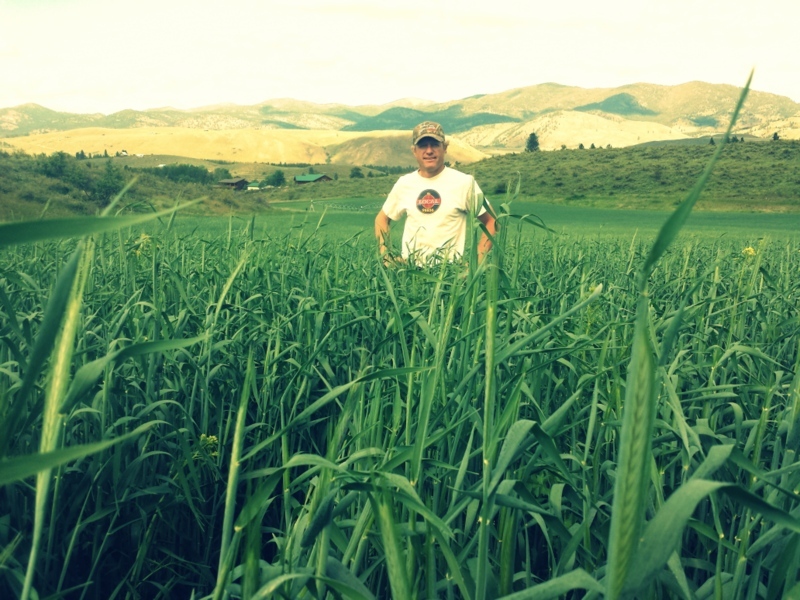 Photo Credit: Brooke Lucy / Sam standing in his 2014 Rye field.